The barrier stretches almost 1000 km along the northern border with Iraq, in the area dominated by the militant fundamentalists. A similar wall is placed at the southern border with Yemen. 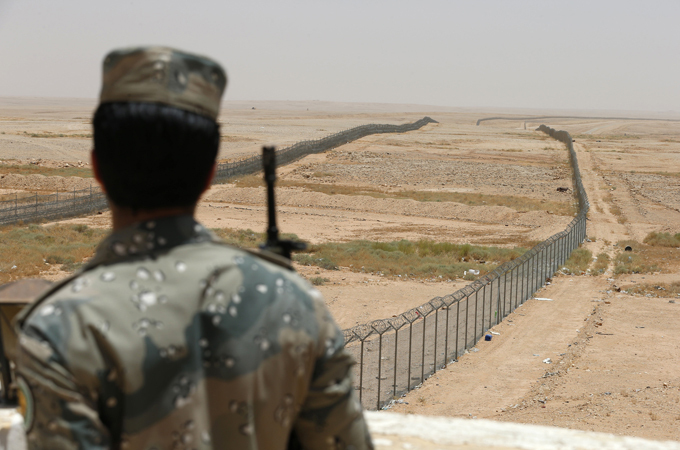 Last week three Saudi border guards were killed by jihadists. Many Saudis are supporters of the Isis ideology and violence. Riyadh (AsiaNews / Agencies) - Saudi Arabia is building a "Great Wall" almost 1000 km long on the border to separate the north of the country from the area of ​​Iraq under the rule of the Islamic State (IS).The Islamic radicals, who share the same style Wahhabi religious fundamentalist with Saudi Arabia, accuse the Kingdom of having betrayed Islam in the name of corruption and collaboration with the West.The idea of ​​a walled border arose in 2006, in one of the most violent phases of the civil war in Iraq. Work began last September, after the IS occupied part of the western and northern Iraq, straying from Syria. According to witnesses in the wall construction includes five layers of defense with observation towers equipped with radar and night vision goggles.Saudi Arabia has already built a wall even longer than 1000 km, on the border with Yemen, to protect themselves from al Qaeda militants. The attempt to isolate itself from its Arab and Muslim neighbors clashes with the fact that Saudi Arabia is the custodian of the two most important holy places of Islam, Mecca and Medina, the annual pilgrimage destination for all Muslims in the world. Last week a group of IS militants, clashed with the Saudi border guards in the area of ​​Arar, near the city of Anbar in Iraq. Three Saudi soldiers and four militants died in the clash. At least one of the attackers blew himself up with an explosive belt, after being caught by the Saudis. Saudi Arabia is suspected of having supported the militants of IS when they were fighting in Syria under the name of Isis (Islamic State of Iraq and the Levant). Many Saudis support the struggle of the IS in Iraq against Shiites, Christians and Yazidis.